The German Research Foundation (DFG) has approved funding for the establishment of a new Collaborative Research Center (CRC) at Johannes Gutenberg University Mainz. 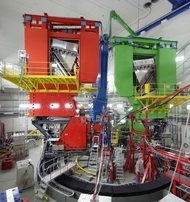 Beginning in January 2012, CRC 1044 “The Low-Energy Frontier of the Standard Model: From Quarks and Gluons to Hadrons and Nuclei” will tackle fundamental questions within the world of subatomic particles. The high-precision measurements and theoretical analyses planned as part of this project will be carried out by the physicists working with the MAMI electron accelerator in Mainz in cooperation with Chinese colleagues at the Institute of High Energy Physics (IHEP) in Beijing. The coordinators of the new CRC are Professor Dr. Achim Denig (experimentation) and Professor Dr. Marc Vanderhaeghen (theory) of the Institute of Nuclear Physics at Mainz University. The role of hadrons, which are subatomic particles composed of quarks and gluons, will be investigated at the Collaborative Research Center 1044 in the context of particle and atomic physics as well as nuclear astrophysics. Hadron physics is playing a central and unifying role both at the highest and the lowest energy scales. However, the current lack of quantitative knowledge about the related strong interaction is presently hindering progress on the central questions of the research fields mentioned above. On the one hand, overcoming the low-energy limit of the Standard Model will have a direct impact on big questions of atomic and particle physics. On the other hand, the precision measurements will contribute to our knowledge of the structure of hadrons and give us insight, for example, on how quarks and gluons join together to form hadrons. The concrete goals of Collaborative Research Center 1044 in terms of physics include, among others, a more exact determination of the anomalous magnetic moment of the muon and the electromagnetic fine structure constant, a solution for the so-called proton-radius puzzle, and the precise measurement of the electroweak Weinberg angle. In order to achieve these goals, CRC 1044 will foster strategic cooperation between the Mainz Microtron MAMI and the Beijing Spectrometer BES-III. This innovative approach, which combines measurements from electron scattering (MAMI) with those from electron-positron physics (BES-III), will make a decisive contribution toward overcoming the low-energy frontier of the Standard Model. The Mainz Microtron MAMI at Johannes Gutenberg University Mainz is a particle accelerator generating high-intensity electron beams that has been in operation since 1990. In 2007, as part of the fourth upgrade stage, the endpoint energy of the beam was increased to 1.6 Giga electron Volts (GeV). This electron accelerator is used by scientists from around the world to conduct experiments in atomic and particle physics. Its distinguishing features include its sharply defined beam and its high level of accuracy. Accordingly, this device is particularly well-suited for undertaking precision analysis of the structure of matter at the subatomic level. The projects within the new CRC 1044 are also integrated into the JGU Cluster of Excellence Precision Physics, Fundamental Interactions and Structure of Matter (PRISMA), which has made it to the final selection round of the German Federal Excellence Initiative.